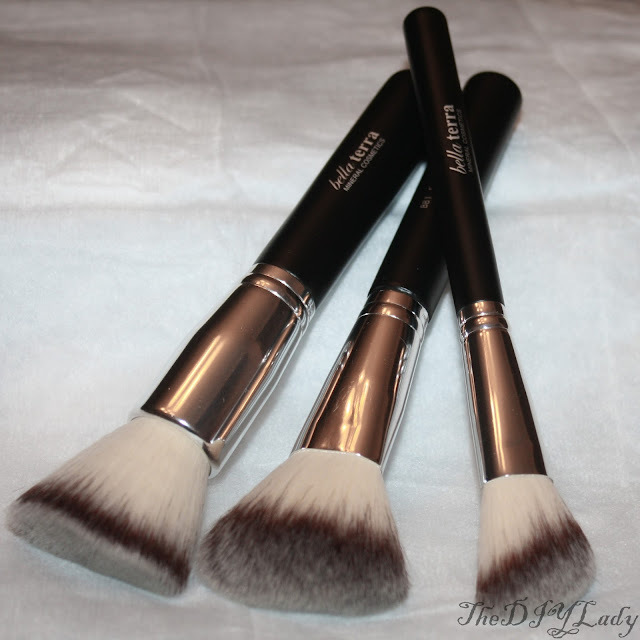 Today we are talking BRUSHES!!! Yep! Those wonderful makeup tools that I couldn't believe I used to live without. I was a die hard FOAM PAD girl! I wouldn't use my powder without the foam pads that come with the powder! Ha! Little did I know what I was missing! My first time trying brushes, I was like "WHAT IS THIS MESS"? I tried a very terrible brush you see... 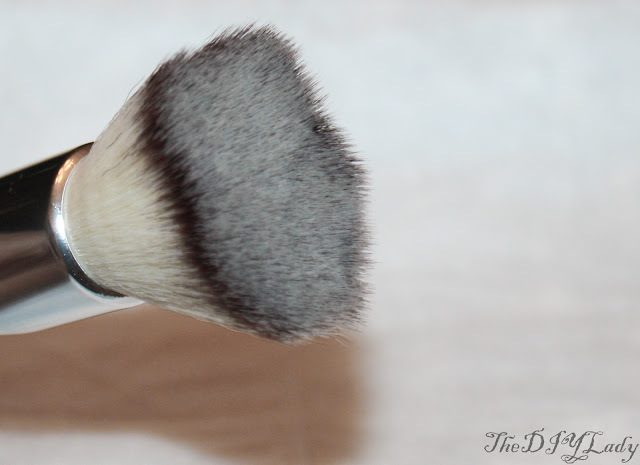 So I swore off brushes until I discovered that quality matters when it comes to facial makeup brushes. 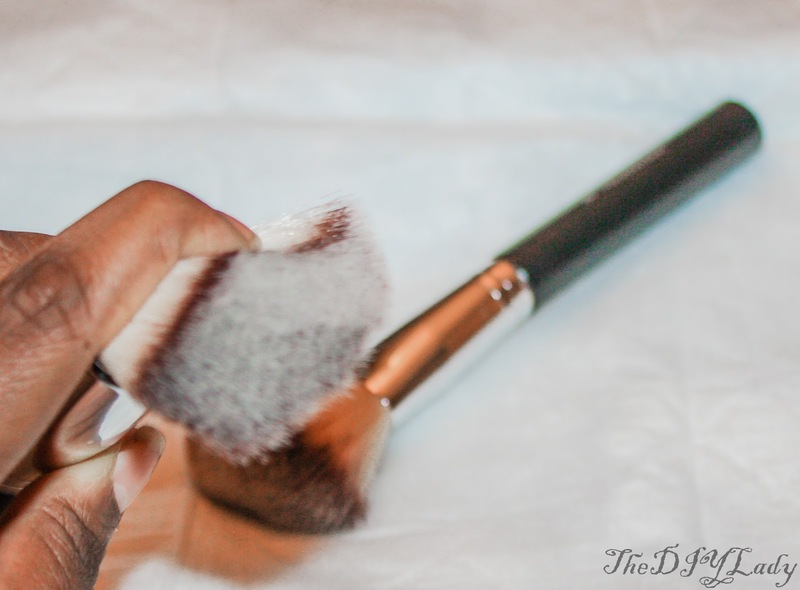 On the blog right now are makeup brushes by Bella Terra Cosmetics, and boy oh boy, these certainly pass the quality test! Yes hunnies, I am on a Bella Terra Kick! I keep waiting to be disappointed, but so far, impressed is all I've been! Picture below: Posing with the Bella Terra Foundation brush. My makeup was completely done with Bella Terra Mineral Cosmetics. Pigments as my lippy and eyeshadow and Mineral Foundation (as my powder). 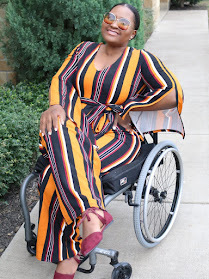 I've reviewed these already on here, and you guys can check those posts out by clicking HERE and HERE. And now to the brushes and review. 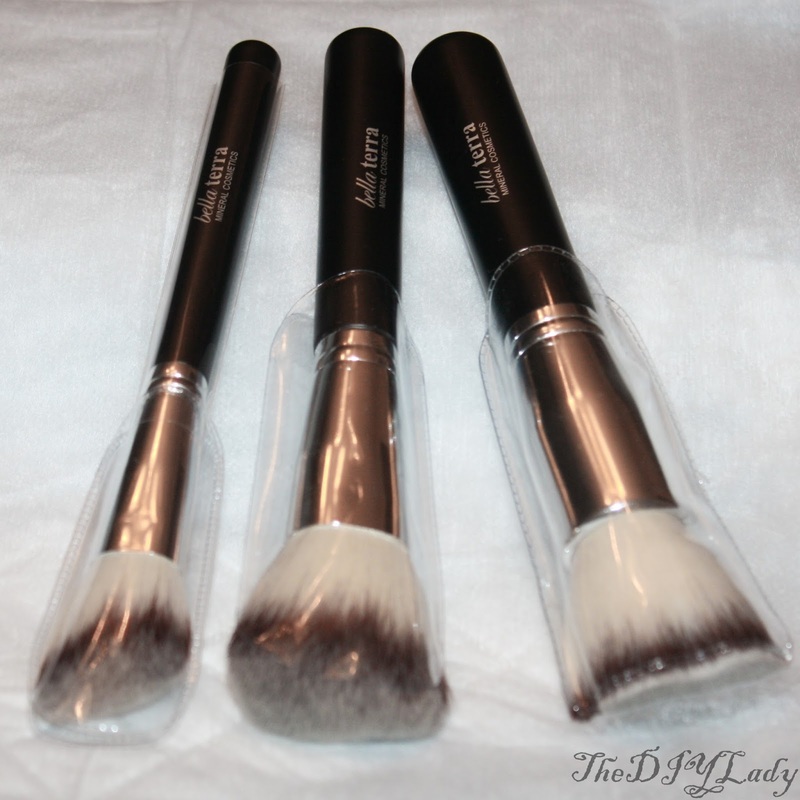 Here are all the three brushes I was sent for review. Below, Left to right: Blush brush, Foundation brush, Bronzer Brush. 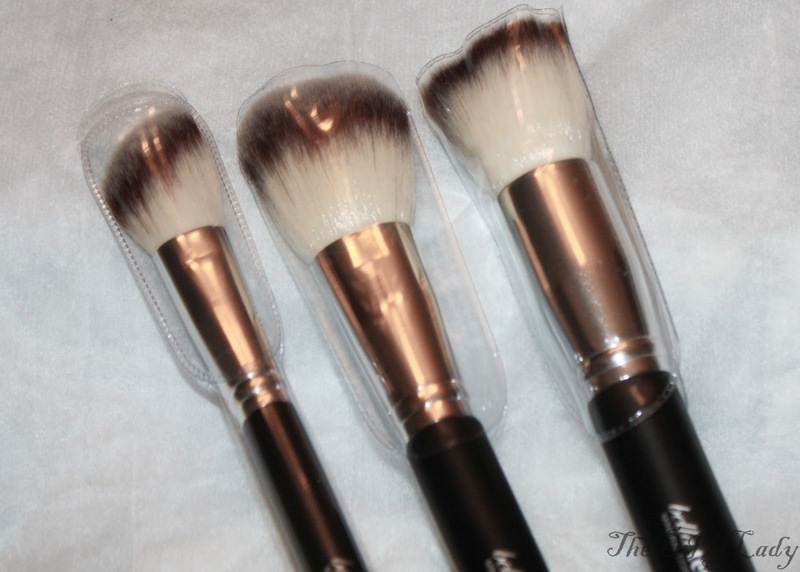 The brushes have really nice sturdy handle that enables a person to hold them well while using. The handle is not too long or too short and I like that. They also each came with the plastic covers you see on them below. And now, detailed view of each brush. First up is the Bronzer Brush. Everything is even on the brush, and the whatchamacallit (brush hairs?) are pretty well secured into the silver thing holding them. Next up is the foundation brush. This one was the one I used for my Bella Terra Mineral Foundation. Application was lovely! 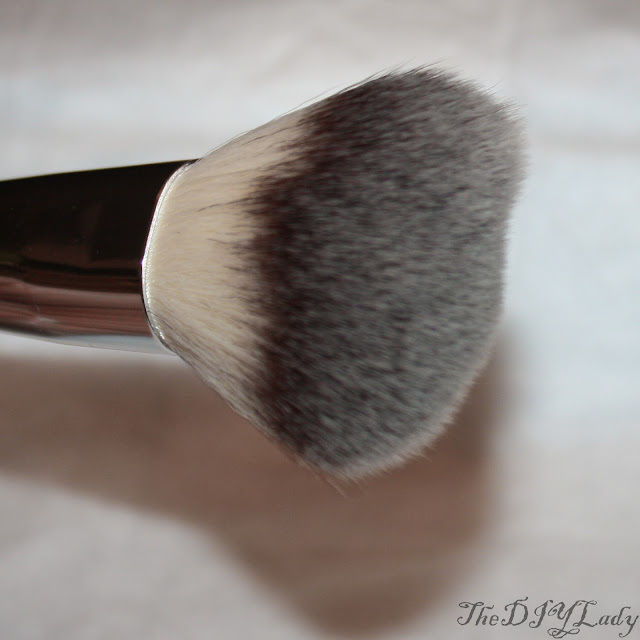 This brush is really soft, but not too soft that you have no control of application. Again, this too has very even brush hairs. 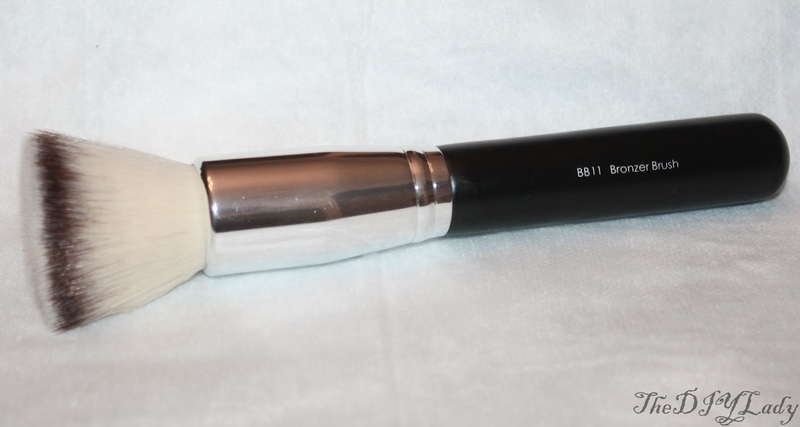 And last but not the least, the Blush Brush by Bella Terra Cosmetics. The brushes certainly don't look or feel cheap. They look quality and they work well. Look below.. I squished one together and all the brush hairs bounced back to position... Again, the hairs are soft but NOT too soft. I was eyeing some brushes by another company before I tried these, but I am currently saving up to buy the remaining of the Bella Terra Brushes because I love these three so much. As a bonus, I added some pictures of my FOTD. As stated in the beginning, everything on my face is by Bella Terra. 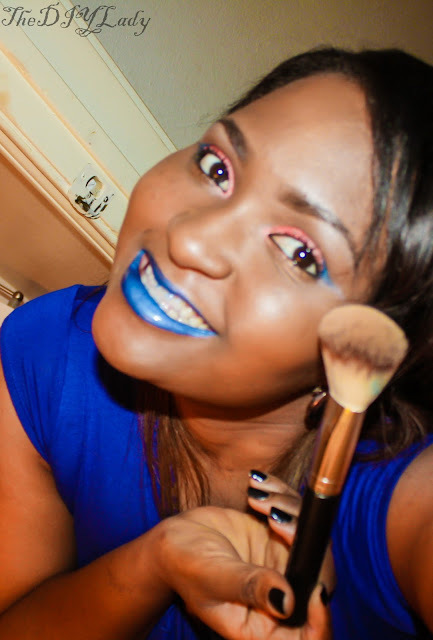 My blue lips crack me up.. but I look Vogue, No? LOL.. Hahaha..
Just the pigments on my lips here.. I used lip balm before applying so the pigment stick to my lips better. Eyes, Bella Terra Pigment without Shadow Primer. The colors still pop. And below I added Bella Terra Lip Gloss to my blue lips while posing with the Bella Terra Foundation Brush I used to apply my bella Terra Mineral Foundation. 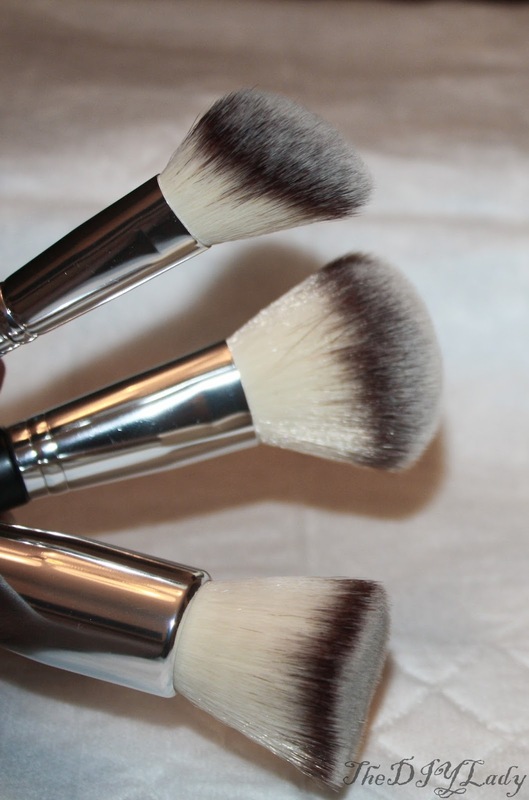 The brushes really work well with the Mineral products. Especially the loose powder/foundation. I recommend these if you can afford them, they are a great investment in my opinion. 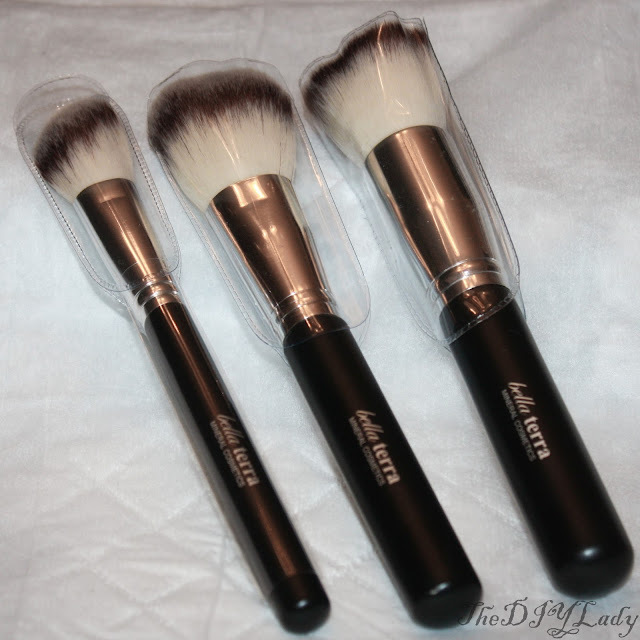 If you're interested in these brushes or want to check out more products by Bella Terra Mineral Cosmetics, please visit their Website, Facebook, and Twitter pages. love the blue lips! I'm bold enough to wear them out so I will def steal this look! Oh my gosh! I flipping love love love the blue lips! You look ace! I love the brushes. I want them all!! Your makeup looks FAB. 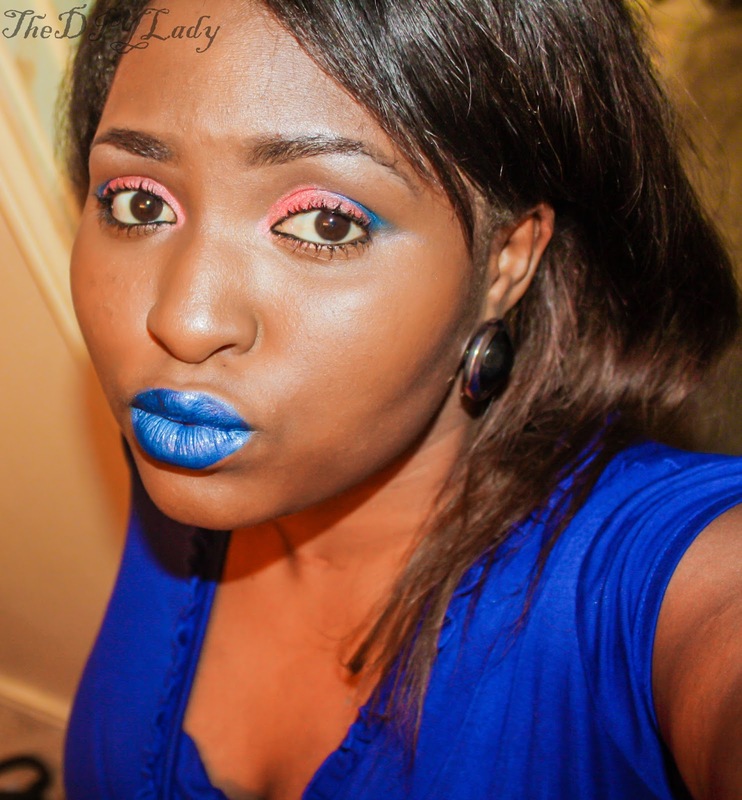 I have tried blue lipstick yet but Im considering giving it a try. I LOVE THE LIPS!!! 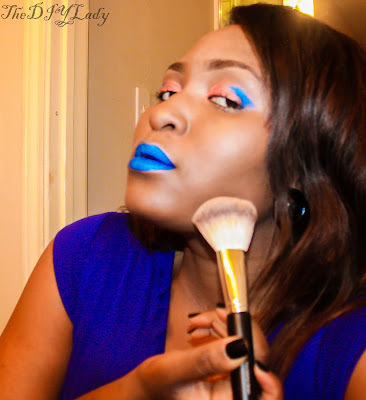 Oh yeah, you totally can rock the blue lips! Those brushes look so nice! I never thought I would say this to anyone... but you seriously ROCK this lipstick! 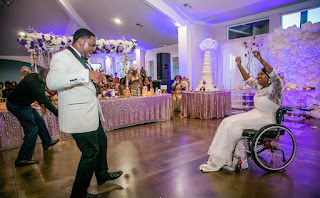 Look at you! SO glam! I love the blue lips on you! 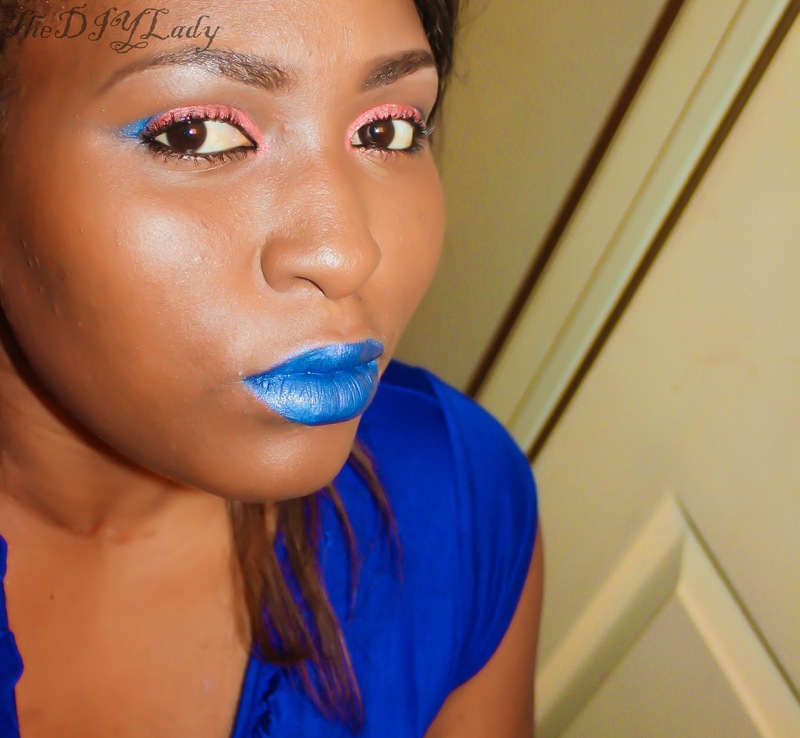 You can rock a blue lip!! And your pics are awesome...even the brush photos. perfect. i love how pigmented those blue lips are! The brushes sound nice and you ROCK those blue lips girl! Honestly, you have the perfect skin tone for it!! Loving the brushes! and you look adorable! Love the brushes. I am not brave enough, nor young enough, to try blue lips though. Those brushes look so fluffyyyy! I'm impressed with how vibrant the blue is!